In tomorrow’s Milwaukee Journal Sentinel, in honor of Mother’s Day, I have a short story on how Corban’s nursery came together. Look, it’s posted online right now if you want to read it! 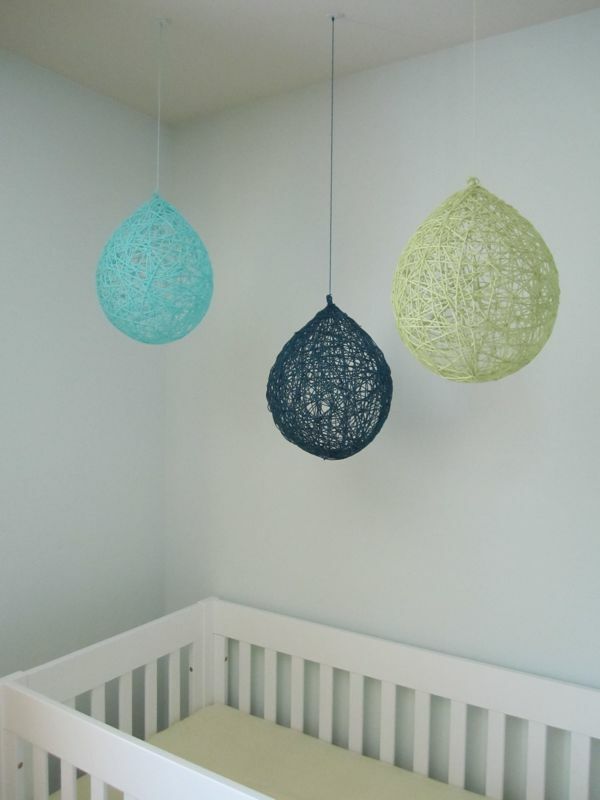 I’ll write more about it in a few upcoming posts, but right now I want to share how to make the yarn balloon pendants hanging over the crib. 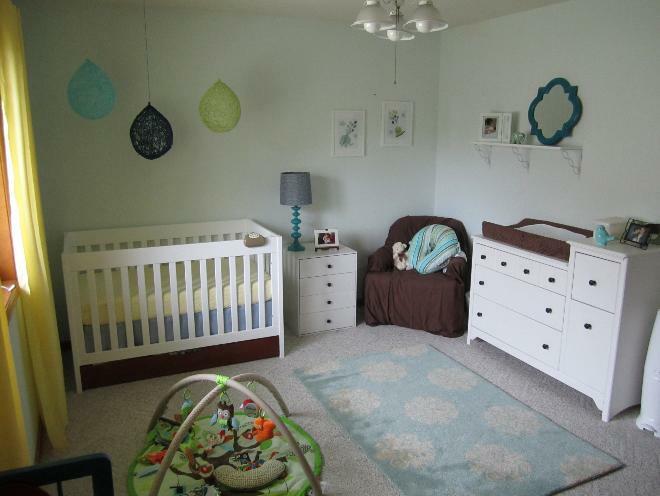 If you remember from my inspiration board, I loved the idea of hanging paper lanterns over the crib. 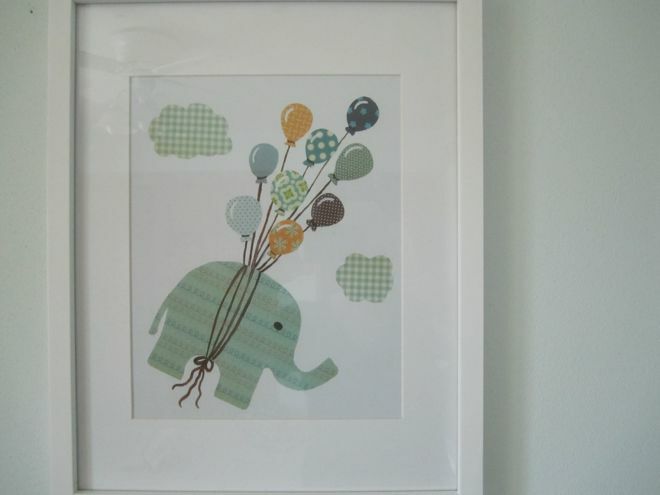 Then I saw balloon-shaped yarn party decorations on Pinterest, and realized they would fit perfectly with the print of an elephant being whisked away by balloons that I had already hung. STEP 1: Stir together an approximately 50/50 mixture of glue and water. Regular old Elmer’s works fine. You can also get by with a little more water than glue. No real need to measure it. STEP 2: Cut about 30 to 40 3- to 5-foot pieces of yarn. 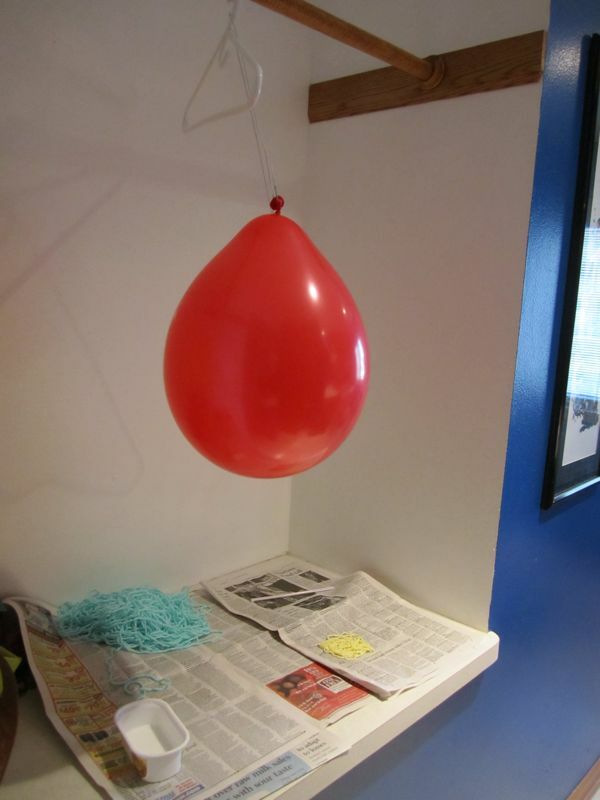 STEP 3: Blow up a balloon to your desired size and suspend it somewhere where you can get a little messy. 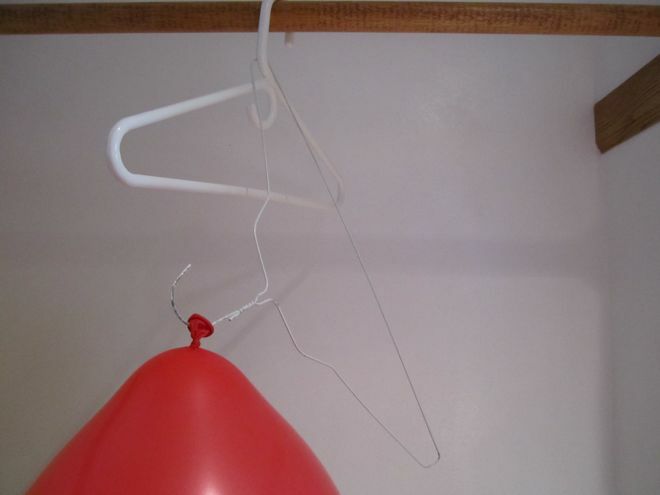 I found that the easiest way to suspend the balloon was to pierce through the tip with a wire hanger and hang it on a rack in the laundry room. Looking back, it might have been easier to use a safety pin instead of a wire hanger. You will also want to put some newspaper or a dropcloth underneath to catch drips. STEP 4: Dip a piece of yarn entirely into the glue mixture. Wring it between your fingers to remove excess glue as you lift it out. Hold one end of the string at the the tip of the balloon and carefully wrap the yarn around the balloon in a random pattern. Tuck the other end of the yarn under or around itself to keep it on the balloon. 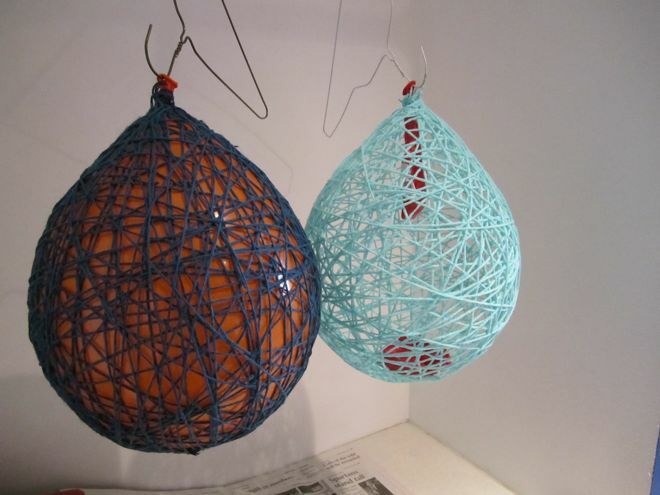 Repeat with remainder of yarn pieces until you have reached your desired coverage of your balloon (like the one below on the left). STEP 5: Let the yarn dry for at least 24 hours. I think I gave mine a good two days, or until it was completely dry on the bottom. STEP 7: Use a thumbtack or pin to pop the balloon. 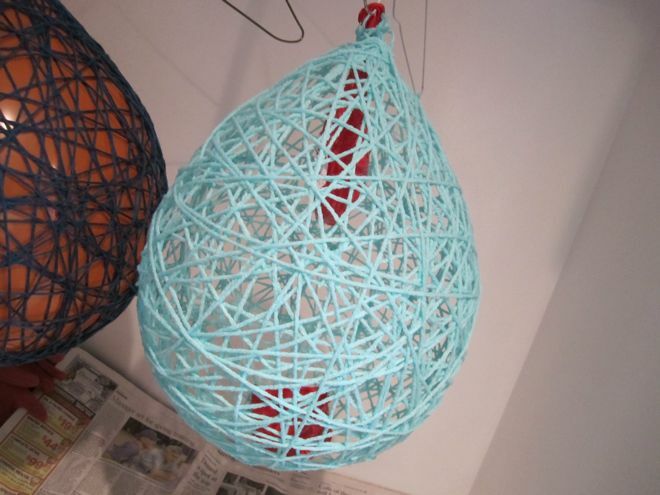 Carefully extract the balloon pieces from the center of the yarn ball and remove it from the hanger. 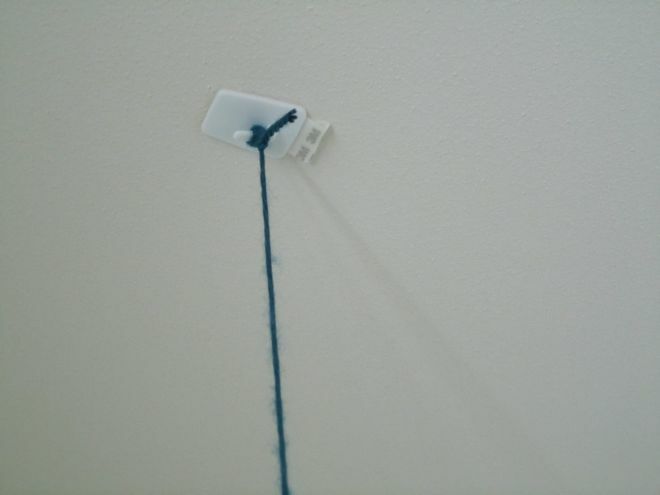 STEP 8: Tie a piece of yarn tightly around the top of the balloon and hang it up! Unfortunately, my dark blue balloon suffered some damage from curious cat explorations when they were first hung. The cats have since lost interest, and I’ve lost motivation to re-do it, but there’s always the possibility that someday I’ll replace it. I’m also considering adding another couple to fill out the area a bit. This project wasn’t too challenging, but it was a bit mundane wrapping string after string around the balloons. In the end, it was worth it since it works so perfectly in our nursery, but as you can tell I’m not overly enthusiastic about repeating the process anytime soon. Stay tuned for some more nursery tidbits and DIY projects in the coming week. Thanks for the in-depth tutorial. I am interested in taking on our baby’s nursery as a diy. I am loving your yarn balloon pendants. This is the most in-depth tutorial I’ve found. I’m planning on making these for decorations for my baby shower and then using them to decorate my nursery (maybe). How long did one of these take you to make? I probably spent about 30 minutes or so cutting string and gluing it onto the balloon. Pretty tedious, but after that it’s easy. Good luck! Hello, your balloons turned out lovely! I’m curious why you chose to cut the yarn in many pieces rather than use one long piece? 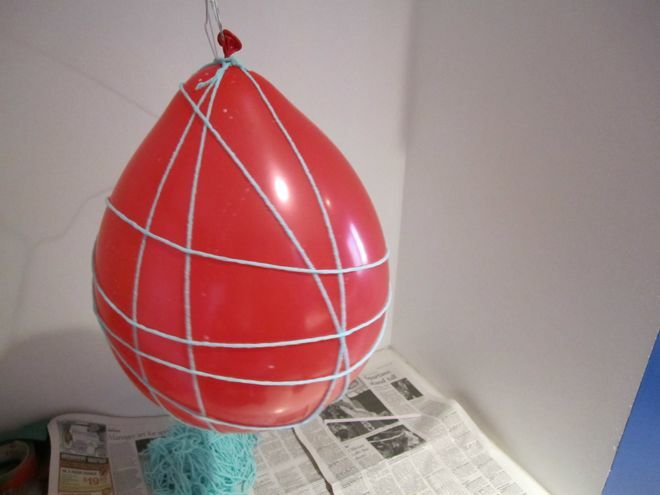 Also, I saw a similar post that suggested coating the balloons with petroleum jelly before wrapping to prevent the yarn from adhering to the surface of the balloon. Any thoughts on whether that approach might be effective? Hi Laura, good question! I honestly didn’t think to use one long piece, but at first thought that sounds appealing. One issue I could see arising would be the string getting tangled (it wasn’t always easy to avoid that even with shorter pieces). It also might be harder to get the balloon shape, if that’s what you’re going for. Having some of the strings start or end at the tip gave me a good place to tie and hang the pendants from in the end. Just an update to say that our balloons turned out perfect! We followed your instructions exactly, so thanks for the great post. One thing I do suggest to others who might try this is to use cotton yarn. I think it really absorbs the glue mixture well. I could see where using synthetic yarns could cause problems as they dont seem to be that absorbent. So glad to hear they turned out well for you 🙂 Thanks for the tip. Can you please tell me what yarn you used? I tried with Acrylic but could not get it to work. Hi Lorene, I used acrylic yarn. What didn’t work for you?